Home » Media Relations Opinion » Does Media Relations Even Matter Anymore? It shouldn’t surprise anyone to hear that newspapers, TV and radio news departments are nowhere near as influential or financially healthy as they were before social media came along. You may know someone who reads the newspaper every day or organizes their evenings around watching the local news, but that person is likely an exception. A survey from 2017 showed that more than two-thirds of people get at least some of their news from social media outlets like Facebook and Twitter. So, if you’re a business owner or a PR practitioner, is it worth it to focus your efforts on getting coverage in your local media? I think it’s definitely still worth including media relations as part of your marketing mix, for several reasons. First, when people get their news from social media, many of them are actually reading links from news outlets that have been posted there. So, really, the news media is now in part a content creator. If a story about your business is the content, then more people could end up seeing it because of the story being shared on social media. Second, if you have a local business, the hyper-local news outlets may be the only ones providing coverage of local businesses like yours. Most communities have at least a weekly paper, and with many of these publications it’s much easier to get a story printed about a local business than it would be in a larger daily newspaper. 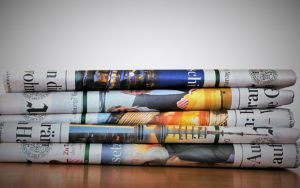 While the readership of these community newspapers is small, nearly all of the people reading the paper are in the area where your business operates. That’s valuable. Finally, a third party endorsement is still worth something. One thing that has always made a positive story in the news media valuable is that the reporter is essentially saying that they feel your business is worth reporting about. While public opinion of the news media is rather low right now, you still want people saying things like that about your business. Obviously the media, particularly newspapers, will never get back to the kind of influence they had 50 to 75 years ago, when most cities had at least one morning and one evening newspaper, and nearly everyone read them. But, despite today’s screams of “fake news,” the news media, particularly the local news media, retains enough usefulness that ignoring them altogether in your marketing would be a big mistake.